The era of modern, protected bike lanes is finally coming to Victoria, as the City of Victoria looks to close a gap along Pandora St from Cook St to the Johnson St Bridge. Staff have recommending a trio of different options (PDF) but not much else to help guide a decision. Looking at the wealth of modern research on biking out there, what does council need to know before they make a decision? 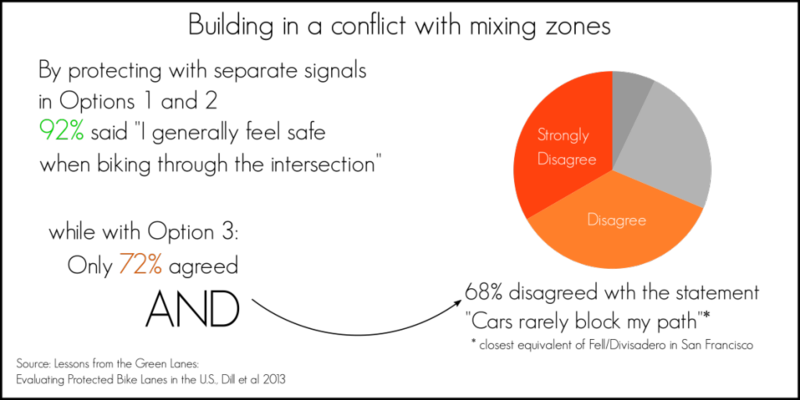 Turns out, nearly everybody who studies this agrees: we need bikeways that are safe, comfortable and convenient. How do the three options for Pandora stack up? Running right through downtown, the Pandora corridor connects the major north-south streets with the Johnson St Bridge. 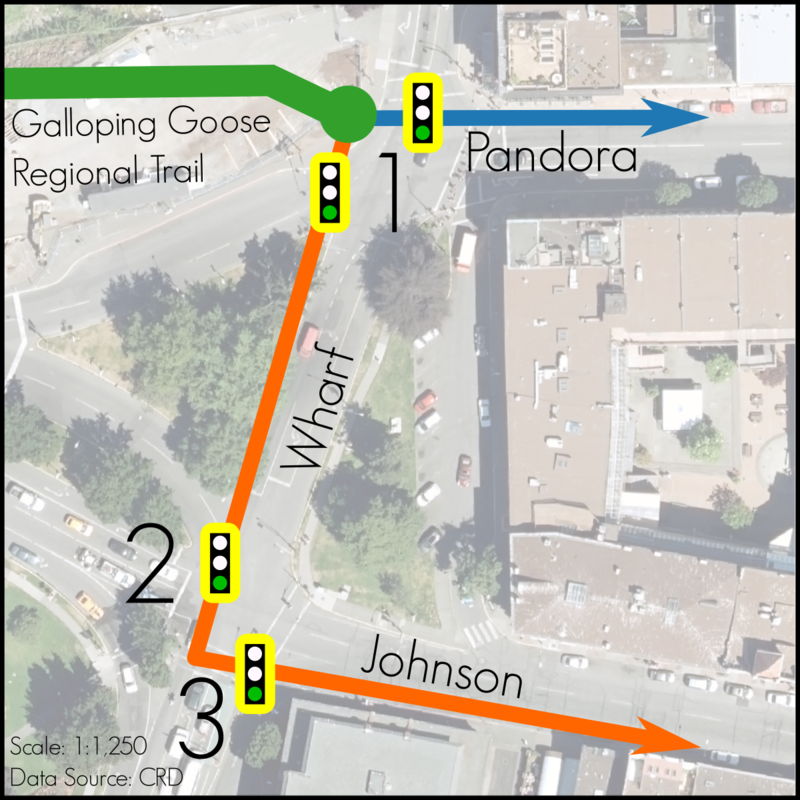 Crucially for people riding bikes, it is a natural eastward extension of the Galloping Goose Regional Trail. Thankfully, thanks to the long lag between getting our first protected bike lane in the CRD, we have a wealth of research to draw from, including an excellent report by Jennifer Dill and others at Portland State University. She looked at the all the various protected bike lanes in the US, and did a huge amount of research into ridership, comfort, perceptions and other factors. I strongly recommend you read the final report: Lessons from the Green Lanes: Evaluating Protected Bike Lanes in the U.S. I will draw from it below as I compare each of the three options. Biking is very safe. Even when forced to mix it up with cars, biking is still about as safe as nearly any other way of moving. But that doesn’t mean the current Pandora is as safe as it could be. Multi-lane roads with high speed like Pandora are probably the most dangerous place to ride currently. Bicycles have to mix with cars, heavy trucks and buses, not a recipe for high comfort. Pedestrians are also in conflict with vehicles turning right. 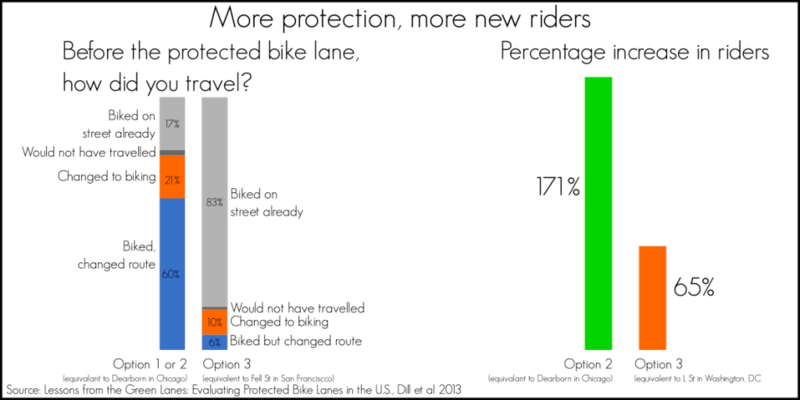 Of the three options, Option 3 has so-called mixing-zones as can be seen to the right. Not only does this create a potential rear-end collision zones, people riding bikes simply find them less comfortable and useful. Comfort and perceived safety are strong determinants for the Interested but Concerned population on whether or not they ride. 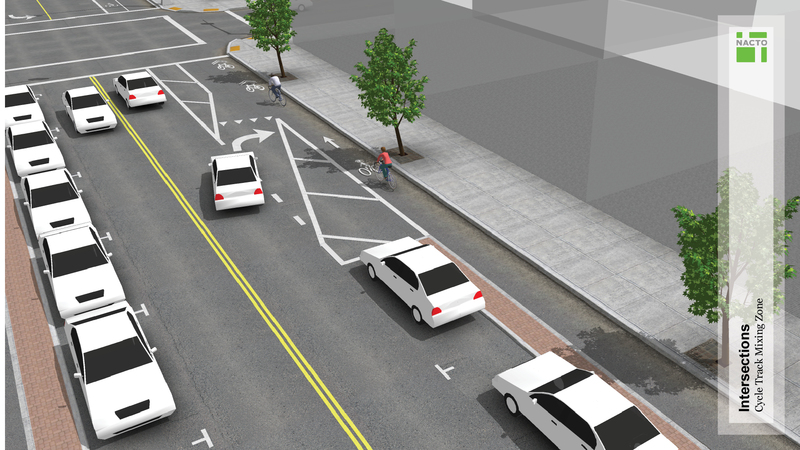 Unsurprisingly, the two fully signalized options will likely generate the highest ridership gains, especially with helping car drivers choose biking. Fully signalized options not only attract more riders, they also saw twice as many people change to biking than any other design. Biking is often the fastest way to travel through an urban area, especially in a downtown where speed is determined more by intersections than the streets themselves. Here the two-way design offers significant speed advantages over either of one-way designs. 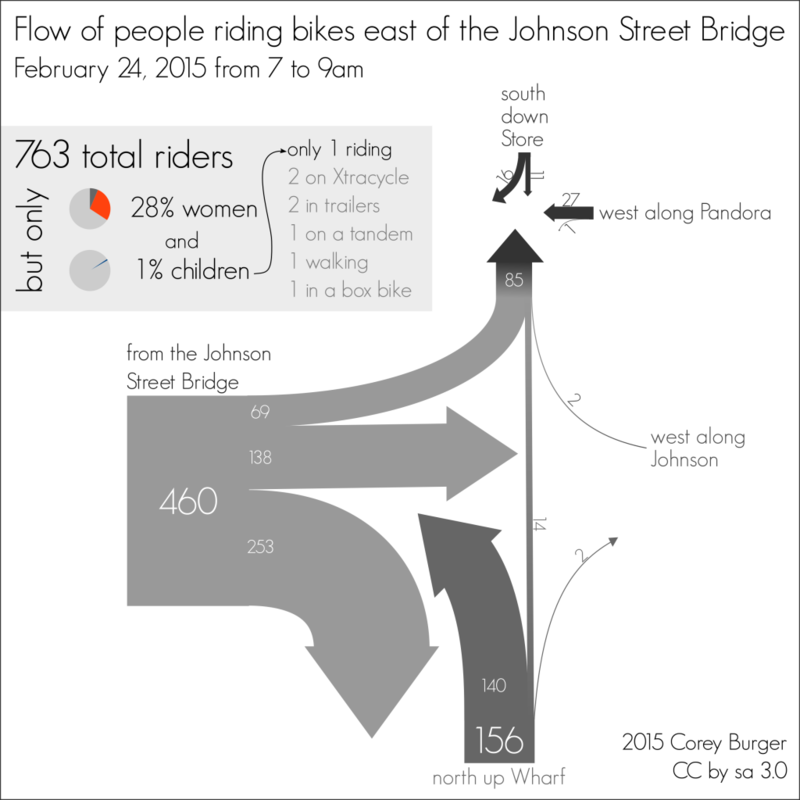 Bike riders wishing to travel east along Pandora to the major employers or shops along the street need only cross a single intersection just east of the Johnson St Bridge, while either one-way design forces riders to wait two or three light cycles at Wharf Street. It is pretty clear, once you lay it all out, you get one option: a two-way protected bike lane on Pandora stands out as the best option. Mixing zones in Option 3 are less comfortable and get less riders, while the ease and convenience of a two-way on Pandora with Option 1 can’t be beat.